I prepared this dish because it was simple and very similar to my mother's recipe for stew. I was a bit doubtful because of the lack of seasonings beyond salt and parsley, but I thought if it needed something I'd be able to add it at the end - there was no need for doubts, the stew was delicious, with those deep flavors of home. It's so simple that I'm sure I'll make it again. 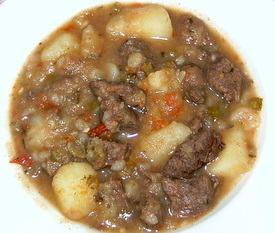 The recipe was very simple and did not have specific instructions as to whether the meat and vegetables had to be cubed as in a stew or left in big chunks as in a puchero - so I cubed them, as I do with my regular stew. That worked well with the beef but not the potatoes, which cooked quickly and started to disintegrate. Still, that gave the sauce a thick, smooth texture that was very good - so what I'd suggest is that you cut the potato in big chunks. I didn't realize that I didn't have parsley until after the stew was on the stove, needless to say dried garlic worked very well. You can use either. Heat the oil in a large cooking pot and sautee the onion until golden. Add the garlic and sautee for a couple of minutes. Add the meat, salt, and brown on all sides. Add the bell pepper, the tomatoes, potatoes, bay leaves and parsley. Mix well and add enough water to cover the top. Bring to a boil, then bring down the temperature and simmer uncovered for 1 1/2 hours.